ePublishing Knowledge BaseePublishing Knowledge BaseePublishing Knowledge Base Creating, Managing, and Selling Products How do I add sales tax? Some states may require sales tax for products purchased for your site. This is an optional feature for your website. Most commonly, physical products are taxed in the state where your business has a physical presence or location. If your location and the user's ship-to state match, it will activate the tax. Also required: the product and the sales tax classifications must match. For some states, for example, a different sales tax is applied to books than other products. Some publishers choose to set up sales tax to meet that requirement. Other publishers choose to have one overarching sales tax applied. In that case, you still must have a classification (set up in the Taxonomy Manager) that is applied to both the product and the sales tax category. Learn more by reading this step-by-step article. If you still have questions, please contact your ePublishing Solutions Manager. Please work with your accountant or tax advisor to determine which U.S. states or Canadian provinces you need to collect sales tax and for what products and at what rates. Alternative: Talk to your Solutions Manager about setting up the appropriate sales tax rates by state or integrating a third-party service into your website that may update those rates automatically. 1. 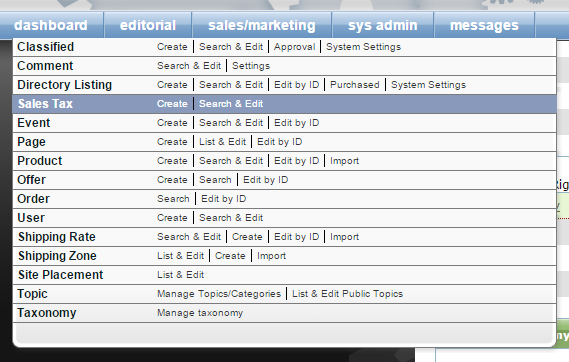 Access the Sales Tax Manager under Sales/Marketing in your Dashboard. 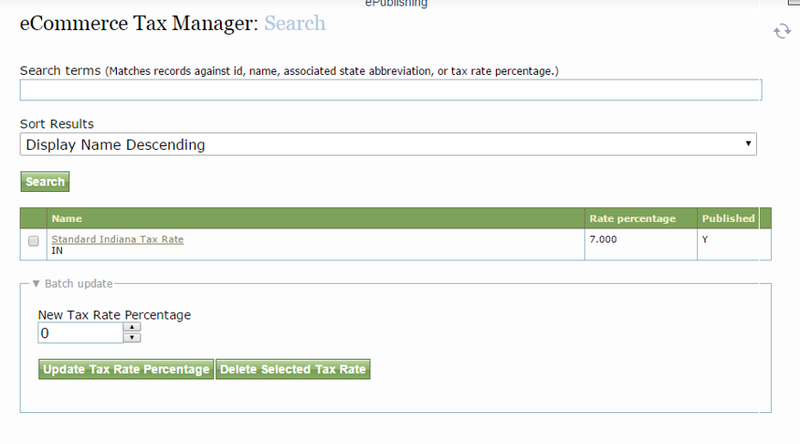 View existing sales tax rates by clicking Search & Edit. Create new sales tax rates by clicking Create. 1.1. We recommend talking with your Solutions Manager before updating or creating any tax rates in your Sales Tax Manager. Zoom: We recommend talking with your Solutions Manager before updating or creating any tax rates in your Sales Tax Manager. 1.2. Associate your sales tax with the correct classification. For example, if the sales tax rate applies to books, select books under Products. Zoom: Associate your sales tax with the correct classification. For example, if the sales tax rate applies to books, select books under Products. If you still have questions, please contact your ePublishing Solutions Manager. 1.3. Make sure the product itself is tagged as a book (or other product type) by clicking the box next to the name. Zoom: Make sure the product itself is tagged as a book (or other product type) by clicking the box next to the name. This will ensure correct application of the tax. For example, if someone who is located in the state in which you have a physical presence buys a book on your website, he would be charged sales tax. 2. 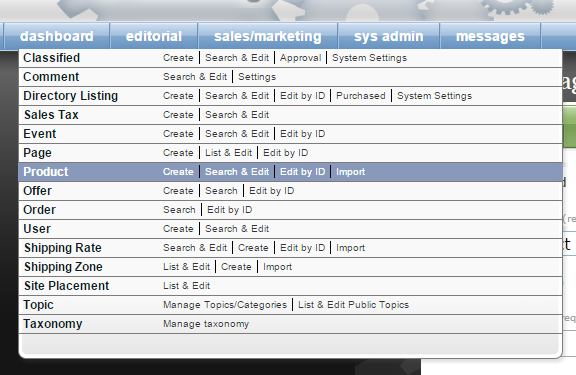 To set a product as "taxable," open your product in the Product Manager under Sales/Marketing in your Dashboard. 2.1. Scroll down and check the box next to Taxable? 2.2. 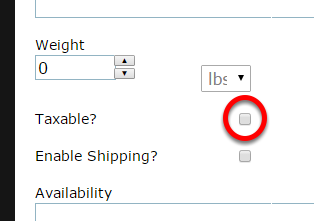 To enable shipping and collect a ship-to address, check the box next to Enable Shipping? Without this checked, a user will only be asked to provide a bill-to address. A ship-to address is required to trigger the appropriate sales tax. 2.3. Under Edit> Supplemental, select the correct product classification. Please refer to Step 1 for more information on the link between the product classification and the sales tax classification. Zoom: Under Edit&gt; Supplemental, select the correct product classification. Please refer to Step 1 for more information on the link between the product classification and the sales tax classification. 2.4. If you made any changes, scroll down and click Save before exiting. Go onto your site, select the product to add it to your cart, and use a shipping / billing address that would trigger the sales tax. Add a product to your cart that has the same product classification as the sales tax you added, Books. 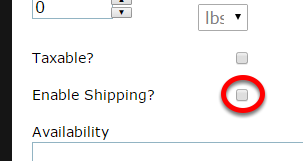 On the Shipping / Billing cart form, enter Colorado as a part of your billing and shiipping address. Look at the cart's Payment page to review the tax rate that was applied to the cart. If it was, your are done. If it wasn't, review that you have tagged the sales tax and the product properly. Prev: How do I update shipping rates? Next: How do I create product bundles?